Rudimentary “Value” metrics measure a static point in time, while traditional DCF models lock into perpetuities that do not take into account the effects of competition. The Economic Margin framework is more than just a performance metric, as it encompasses a valuation system that explicitly addresses the four main value drivers of enterprise value: profitability, competition, growth, and cost of capital. 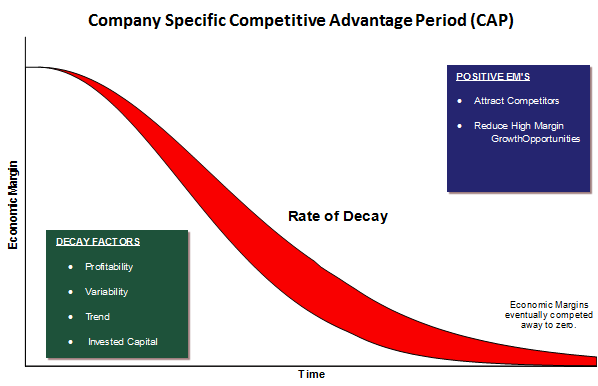 Unlike traditional valuation approaches that utilize highly sensitive perpetuity assumptions, our approach incorporates the widely accepted economic principle that competition will compete away excess returns over time. The Economic Margin framework explicitly models the effects of competition to gradually eliminate the excess spread a firm generates above or below its cost of capital (Economic Margin). Our research provides evidence of four factors that tend to explain the length of time that the market will pay for companies to generate returns above/below its cost of capital. For example, our research suggests that companies with high excess returns are likely to attract competition in the marketplace, requiring a shorter competitive advantage period in the company’s valuation. Subtle insights such as these are just not achievable with traditional DCF approaches that rely on terminal values and perpetuities. Beyond being grounded in the widely accepted economic theories of Nobel Prize winners Merton Miller and Franco Modigliani, AFG’s valuation approach has a proven track record of consistently identifying companies trading above or below their intrinsic valuations across sectors, market capitalization groups, and growth/value universes. The Applied Finance Group’s (AFG’s) valuation approach help investors identify and take advantage of mispriced securities in the market. 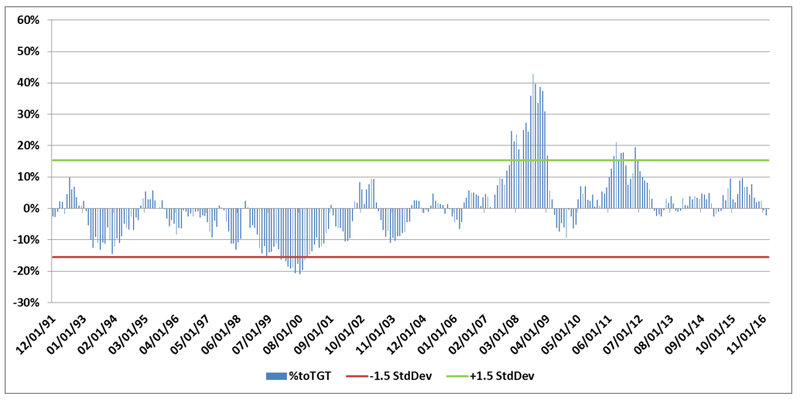 One way investors can identify if a security is over or undervalued is by using AFG’s Intrinsic Value Chart which displays a company’s intrinsic value relative to its trading range helping to identify entry/exit points. The Blue Bars represent the high and low trading range for a stock for 1 year. 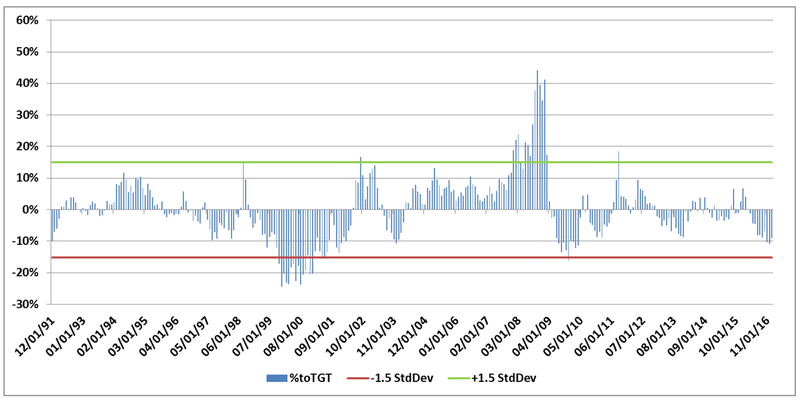 The dotted line represents AFG default Intrinsic Value through time. When the dotted line (Intrinsic Value) is above the blue bars (trading range) the company looks to be undervalued. When the dotted line (Intrinsic Value) is below the blue bars (trading range) the company looks to be overvalued. By aggregating the intrinsic values we can gain insights on how over or undervalued different universes are overtime and relative to one another. One in 2000 stating that the market is overvalued. One in 2008 stating that the market is undervalued. Having a time tested process, during various market and economic environments, is source of incredible insights and that provides us confidence and strong conviction in our investment philosophy. AFG offers a disciplined, successful process for exploration, discovery, modeling and portfolio construction based upon original applications of intrinsic value. They offer clients the research capabilities of a much larger firm and as a result, expand our market reach. Montecito Bank & Trust Over 1 Billion AUM.